The Sempervivi biography begins with Kentucky music stalwart Derek Price. He toured for years with Stellar Kin and Redfoot (Bad Apple Records), as well as Analog Apostles. In 2014, Price stopped touring with the Apostles. Now, he would return focus to his own songs. Longtime fans noticed a more mature songwriting narrative which still hearkened back to his indie rock roots. The driven DIY artist has always been known to cover every detail. He’s constantly booking shows, recording demos, and designing merch. It’s second nature. The Bad Apple Records solo catalog began with the 2015 debut Artifacts acoustic EP. The self produced record embodied minimalism. A handful of mics captured the ambiance of an empty church sanctuary. After the release, Price played solo at a variety of venues. Bars, houses, and bookstores across the country witnessed his repertoire grow. New songs focusing on fatherhood and political cynicism grew his following. Several began as full band demos. Therefore, the sophomore record needed great players to capture the sound. The “So Close” single and music video surfaced in 2017. Then, the full band EP “Always Alive” emerged. Zack Messick (Re-Education Camp) provided bass. Perry Ritter (All the Little Pieces) stepped in on lead guitar. Then, Rob Hanna’s drums completed the studio band. Finally, Beth Jenkins (The Jettisons) provided guest vocals. The pop punk and alternative rock mix clocked a lean 17 minutes. More solo dates, as well as full band shows, followed supporting the record. 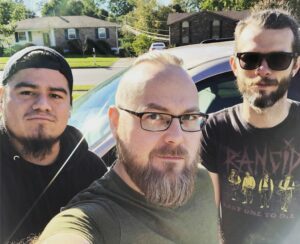 In late 2017, Sempervivi expanded into a power trio with Jon Grayson on bass and Rob Grove on drums. The band’s high energy punk rock set earned praise from local and regional audiences. Grove and Grayson then departed for new musical projects in June 2018. Simon Ricapa (drums) and Jeremiah Floyd (bass) soon completed the new lineup. The new band continued writing and playing gigs throughout the region, while preparing to record their first full length in 2019. (Artifacts is) a pretty breezy, fun EP with a lot of catchy guitar work, solid vocal performances, and an all around good batch of songs. Always Alive hearkens back to the pop friendly, singer-songwriter indie rock of a bygone decade and pays homage to that era beautifully.